The match-ups heading into the second week of the 2019 Australian Open are looking MEGA. In the top half of the draw, six of the eight top 16 seeds have made it to the second week with the only exceptions being the number 17 and 18 seeds, Madison Keys and Garbiñe Muguruza respectively. There are so many players rounding into form and I can’t wait to see how things unfold over the next week. Note I haven’t had time to write about it in this post but for the record, Pliskova vs. Giorgi was another great match! Read on for highlights of day 6 at the Australian Open. Garbiñe Muguruza battled through a gruelling straight sets match against Timea Bacsinszky, winning 7-6(5) 6-2 in one hour and 54 minutes. Muguruza made a slow start and was mistiming a lot of forehands early on, particularly on return. I wondered if it was linked to her late finish against Konta on Friday morning, as well as going up against a different type of player in Bacsinszky who has bundles of variety and doesn’t often give much pace. Muguruza made more unforced errors in the first set against Bacsinszky than in the entire match against Konta! However, she showed flashes of positivity in coming to the net and was very solid overhead. It wasn’t a clutch display by any means as Bacsinszky saved a set point to force a tiebreak but Muguruza kept plugging away. The start of the second set featured some lengthy deuce games. Muguruza ran away with it from 2-2, fighting through fatigue, managing to rely on her serve and continuing to come forward. Muguruza won 21 of 27 points at the net, which I think is a very positive sign. While her net game and volleys can be wayward at times, i’ve always felt that it’s a tactic that has seen enjoy her best results including the two Slam wins. I’m going to keep riding this Muguruza train for the rest of the tournament 😂. I think she’s playing well and is a title contender. Going against her is that she has a brutal draw with Pliskova up next in the fourth round. I can’t get my head around the quality of these last 16 match-ups! The two highest seeds in the second quarter of the draw both suffered scares but survived to reach the last 16. Naomi Osaka won 11 of the last 12 games to beat Hsieh in an absorbing contest. Hsieh had three game points, leading 7-5 4-2 *40-0. Osaka became entangled in Hsieh’s web of awkwardness. The Japanese player, who had served for the first set, was reactive and impatient at the start of the second set, and making far too many unforced errors. From 2-4 down in the second set, Osaka started to take the ball on with more authority and hit through an increasingly poor serving, Hsieh. This was a huge win for Osaka who managed to turn the match around in the nick of time. I questioned how she would get on this year with the sudden increase in attention and expectation. I have been super impressed with the way she is handling everything and she’s playing like a champ at the moment. Definitely not to be discounted at this tournament. Elina Svitolina rallied from a double break down in the deciding set to overcome a valiant effort from Zhang Shuai. Both players took medical time-outs during this match with Svitolina bothered by a shoulder/neck injury. She didn’t want to expand on it in her press conference but said her shoulder hurt and implied it was a pre-existing injury. I thought Svitolina was passive for large chunks of the match. She played a couple of great points at key moments in the second and third sets. Svitolina suddenly started hitting through her forehand at the end of the second set. After failing to serve out the match in the third set at *5-3, Svitolina played two superb points to hold serve to 6-5. I can’t say I am convinced by Svitolina yet but it was a good win because she has lost these kinds of matches before against big hitters at the Slams. She’ll face another one in the next round against Madison Keys and will need to improve if she is to advance. Love this shot that Naomi posted on her Twitter page. Two lovely moments at the end of Svitolina-Zhang and S.Williams-Yastremska. Especially nice from Elina to go over to Zhang Shuai at the end of the match which you rarely see. This actually looked like quite a nasty fall for Naomi but thankfully she was fine! Osaka said it was the umpire. "He was like, Naomi, are you okay? The second week starts on Sunday and with another puzzling schedule. I thought Barty vs. Sharapova would get the first night match billing but instead it’s in the day session. Not a great schedule (thinking selfishly for me!) so i’ll be watching most things on catch-up again. It’s just not worth it for me to watch things live and mess up my sleep when Eurosport Player has everything on catch-up. 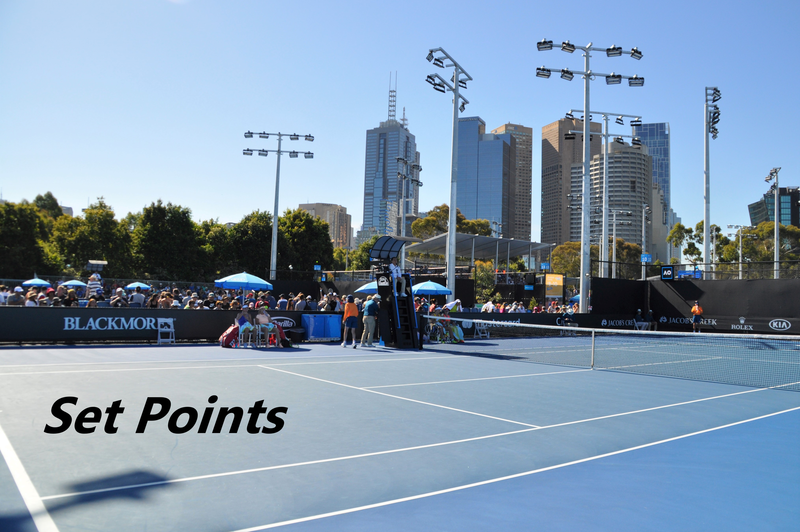 January 19, 2019 in Australian Open, Set Points, WTA. I don’t know… Karolina Pliskova looked GOOD today. She was even in the mood to showcase some pretty incredible defence at times. Muguruza will need to hope for some low energy or play an absolute blinder, based on their previous meetings. Pleasently surprised to see Muguruza in 4th round. Now I’m just hoping that she won’t choke again against Pliskova if she gets into a winning position. Despite their H2H they had a few close matches. Just saw some highlights of Svitolina’s and Keys’ matches today. Just saw the Collins v Kerber score. What?! You know I’ve liked Danielle for a while, but really was NOT expecting this level from her! Yeah, brutal this one. Kerber never got into gear. Taking nothing away from Collins, her play was the reason why. Good win from Pavs today too. She said in the interview afterwards that she’s reached several slam quarterfinals in her career but has never made it past that stage; maybe this time she will. Well if Collins plays like she has this week, Pavs is going to need to bring her A game. She got such a great game all round, big strokes on both wings, solid at the net, great serve, touch plus a quick mover. I hope Pavs wins but feeling like it will be Collins. She seems very confident right now. Petra Kvitova potentially one win away from being #1 now right? I just gave the rankings a run through and by the arithmetic she will ensure there is a new number 1 by beating Barty. I think it’s between herself and Osaka. Svitolina and Pliskova have to win the title for the surest path to no1. If Kvitova makes the final against Serena, she’ll basically be the no.1 by then. She loses to Serena and Williams would’ve beaten both the old(Halep) and freshly minted(Kvitova) top ranked players. Aww, 😦 just looked at your QF predictions James, and the ‘dusting’ of the draw…. It is up to Serena now. It was a great match!! Keep updating..
Nice article about tennis .